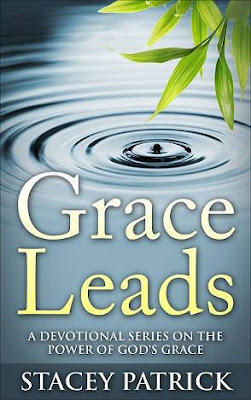 I was delighted when Stacey Patrick sent me a review copy of her first book, Grace Leads. I have been doing this study for the past 5 weeks during my morning devotion time, and it was just what I needed on many of my tired and brain fogged days. Grace Leads is a unique devotional study. Stacey wrote a devotional series on her blog about grace and has now turned that series into a book, which is available in paperback or a kindle edition. This book can be read as a daily devotion, or you can take your time with each day’s devotion by looking up verses, answering questions, and journaling. There is plenty of space in the paperback edition for those who like to write in their Bible study books. Stacey Patrick has a chronic illness, understands the unique needs that those of us with illness have, and has written a study that suits us well. The font is large enough to read on the days when you might be struggling with fatigue and vision problems. Each week’s section contains 5 days of study. If you are too ill to study one day, then you can easily catch up over the weekend. The devotion book is simple enough to read on the hard days, but filled with enough questions to keep you busy on the days when you are able to spend more time in study. If you wish to explore the topic of God’s grace, Grace Leads will be a good book addition for your study time. If you don’t know much about grace, this book will help you to understand better the amazing grace of God that He offers to you. If you have already spent time studying grace, then this book will be a beautiful reminder of His grace and an encouragement to continue to rest in His grace. You can find a sampler of Grace Leads here. Grace Leads is available on Amazon and on Etsy.